California State Senator Ronald Calderon agreed Friday to surrender to federal authorities after being named in a federal grand jury indictment that accuses him of taking tens of thousands of dollars in bribes from a businessman and from people who were associated with a Hollywood film studio, but who were in actuality undercover FBI agents, according to U.S. federal attorneys. Ronald S. Calderon, 56, of Montebello, is charged with mail fraud, wire fraud, honest services fraud, bribery, conspiracy to commit money laundering, money laundering and aiding in the filing of false tax returns. The senator’s brother Thomas M. Calderon, 59, who is a former member of the California State Assembly, is charged in the money laundering conspiracy and with seven substantive counts of money laundering. The indictment describes a scheme in which Ron Calderon allegedly solicited and accepted approximately $100,000 in cash bribes – as well as plane trips, gourmet dinners and trips to golf resorts – in exchange for official acts, such as supporting legislation that would be favorable to those who paid the bribes and opposing legislation that would be harmful to them. The indictment further alleges that Ron Calderon attempted to convince other public officials to support and oppose legislation. In the first part of the bribery scheme, Ron Calderon allegedly took bribes from Michael Drobot, the former owner of Pacific Hospital in Long Beach, a major provider of spinal surgeries that were often paid by workers’ compensation programs. California law allowed the hospital to pass on to insurance companies the full cost it had paid for medical hardware it used during spinal surgeries. In another case filed this morning, Drobot admitted that his hospital exploited this law, which was often called the “spinal pass-through,” by using hardware that had been purchased at highly inflated prices from companies that Drobot controlled and passing this cost along to insurance providers. Drobot allegedly bribed Ron Calderon so that he would use his public office to preserve this law that helped Drobot maintain a long-running and lucrative health care fraud scheme. While the corruption indictment does not implicate Ron Calderon in the health care fraud scheme, Ron Calderon is charged with taking bribes from Drobot to preserve the spinal pass-through law. The indictment specifically alleges that Drobot bribed Ron Calderon by hiring Calderon’s college-age son to work as a file clerk at his company and paying him approximately $30,000 over the course of three summers. Ron Calderon’s son showed up for only about 15 days of work each summer, according to the indictment, which also accused Ron Calderon of accepting plane trips, golf outings and expensive dinners from Drobot. Ron Calderon allegedly arranged meetings between Drobot and other public officials and helped Drobot attempt to persuade the other legislators to keep the spinal pass-through law in effect. In another case filed this morning in United States District Court, Drobot has agreed to plead guilty to charges of conspiracy and paying illegal kickbacks. In his plea agreement, Drobot admits paying bribes to Ron Calderon. In another part of the bribery scheme, Ron Calderon allegedly solicited and accepted bribes from people he thought were associated with an independent film studio, but who were in fact undercover FBI agents. Ron Calderon solicited and accepted bribes in exchange for supporting an expansion of a state law that gave tax credits to studios that produced independent films in California. The Film Tax Credit applied to productions of at least $1 million, but, in exchange for bribes, Ron Calderon agreed to support new legislation to reduce this threshold to $750,000, according to the indictment. The indictment specifically alleges that Ron Calderon agreed to support the new Film Tax Credit legislation in exchange for his daughter being paid $3,000 a month for a job he knew she simply did not perform. According to the indictment, Ron Calderon took several official actions with respect to reducing the threshold for the Film Tax Credit. 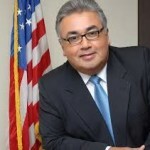 Ron Calderon signed an official letter indicating that he supported a lower threshold, he met with other state senators to discuss the benefits of lowering the threshold, and he “caused legislation to be introduced in the Senate, which he intended to use as a vehicle to create a separate tax credit,” according to the indictment. In addition to the nearly $40,000 paid to his daughter, Ron Calderon allegedly solicited from the undercover FBI agents payments that included $5,000 for his son’s college tuition and $25,000 to Californians for Diversity, a non-profit political organization operated by Tom Calderon. Both Calderons face money laundering charges for allegedly funneling bribe money through Californians for Diversity and Tom Calderon’s consulting firm, some of which went to Ron Calderon and his daughter. Ron Calderon faces two tax fraud charges for allegedly helping in the preparation of false tax returns that fraudulently claimed business expense deductions in relation to the money his son received from Drobot. If Ron Calderon is convicted of the 24 charges in the indictment, faces a statutory maximum sentence of 396 years in federal prison. If Tom Calderon is convicted of the money laundering charges alleged in the indictment, he would face a statutory maximum sentence of 160 years in prison. The investigation into the Calderons was conducted by the Federal Bureau of Investigation and IRS-Criminal Investigation. No doubt a former city of Bell employee. All of this has no meaning. Calderon will be kept in the Senate just as six time convicted felon State Senator Rod Wright, a former field deputy of congresswoman Maxine Waters was found unanimously guilty of perjury last week by a jury on six counts, and he has been allowed by State Senator President Darreel Steinberg and all Democrats to CONTINUE to serve in his capacity. “It was a fuzzy law, he thought he was doing properly, aw shucks, and he’s appealing, let him keep serving”. (Paraphrasing Steinberg). Bear in mind, Wright (from Inglewood and Baldwin Hills) was found guilty of specific election frauds. Of all the people who should get kicked out or forced to resign, crooked Senator Wright only lost a committee chairmanship, whatever that is. Remember that Los Angeles County Supervisor Burke lived boldly in Brentwood outside her district, and had her taxpayer supported county limousine take her to a little cubby hole apartment WITHIN her supervisorial district EACH morning for a brief stop at her desk within that rented apartment. There is no limit to whatever a Democrat elected lawmaker can do without consequence. Calderon will plead to some minor charge, get a suspended sentence or a few months in Club Fed Lompoc tending a rose garden, a small fine or forfeiture, and nothing will ever come of his WHOLESALE corruption. Liberals seem so VERY challenged in maintaining character. Need we look farther than Bruce Gibson or Adam Hill for local examples? Welcome to California. Killeen Texas looks better all the time. Not only is Wright allowed in stay in office but he wants to propose legislation that would reduce a person’s felony (yes, he was convicted of felonies) to a misdemeanor if they don’t serve “prison” time. Under our new prison guidelines of bracelet them and release, half the felonies would not show their true crimes. This from a criminal politician who stays in office and no one cares!!! As long as enough California voters respond to political ad campaigns, politicians will do whatever it takes to get the money needed to stay in power. That “whatever” will not only include repaying their contributors with favors and their constituents with “pork” but it also discourages honest and capable people from mounting an opposition to them. I wonder if it would be possible to eliminate advertising from politics and force prospective candidates (and advocates for initiatives) to go door-to-door or hold public forums to get support. Probably not — they would just hire people to sell the BS and the uncritical masses would buy it just as readily that way. No matter what party this jerk is ‘from’ this is outrageous. Every thing bad about political figures right there in that article. So glad the Federal Government caught him!! ‘them’!! The tip of the iceberg – but don’t expect anymore. This way the government can look like they’re doing their job. BTW, he represents an area that includes the city of Bell, which was notorious for their corruption. Very interesting information. There may or may not be a connection, but the idea is intriguing. Al Jazeera does excellent investigative journalism. It’s a shame that the sociopolitical ignorances of many Americans has stifled Al Jazeera’s reach here in the U.S.
Clearly this is politically motivated because we are always told Democrats never do anything wrong. He is a Democrat? I totally thought he was a Republican (hence why we’re hearing about it and something was done). Wow, times they are-a changin’. I usually wish some of the biggest losers in politics were republican JUST so a spotlight would be shone on them… I’m not a fan of republicans (generally), but they do seem to get the vast bulk of “investigation” and “outrage” from the media and society (who, technically, only follow the media). Anyway, glad to see the FBI doing this, but it does beg the question: who started this investigation/sting and why? The FBI is just a tool… who was using it, I wonder? I guess the fact that this corrupt politician is a Democrat makes no difference as party affiliation is not mentioned in the article. Oh, I forgot that only matters when the offender is a Republican. The wheels of justice grind ever so slowly, but it is good to see the FBI actually following through on this political dynasty and the inherent corruption that is a part of its political DNA; that said, come on FBI, let’s see the trial of Kelly Gearhart finally get to court.